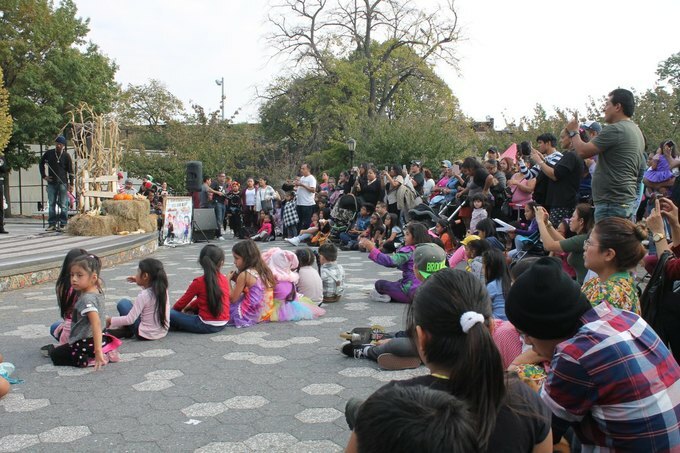 Attendees at the seventh annual festival were treated to a sunny and unseasonably warm afternoon of fun in Maria Hernandez Park. 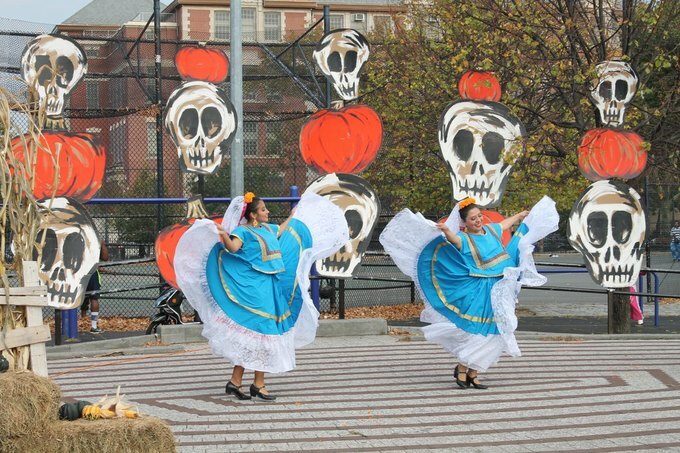 The Bushwick community gathered at Maria Hernandez park on Sunday afternoon to celebrate Halloween, Día de los Muertos and the bounty of the harvest at the seventh annual ¡Calabazafest!, the neighborhood's fun, wholesome and unique seasonal fiesta. 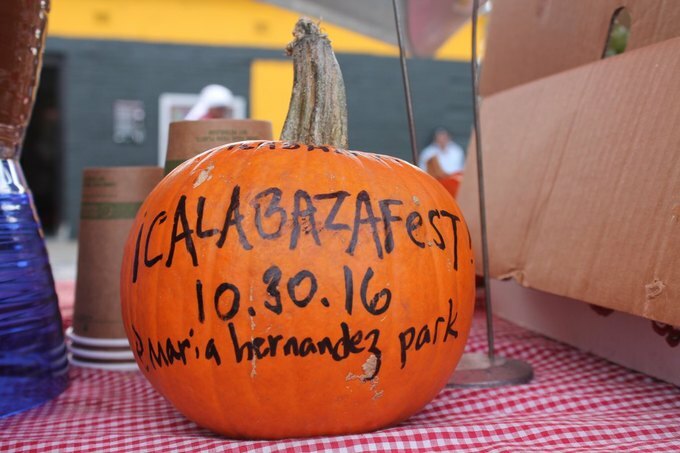 A celebratory calabaza at the mini farmer's market at ¡Calabazafest!. Photo by Simon Glenn-Gregg for Bushwick Daily. ¡Calabazafest! attendees enjoyed balmy, sunny weather with temperatures in the mid-70s on Sunday afternoon before the evening's dramatic downpour. The mild and pleasant afternoon was perfect for the festivities: as anyone who has ever trick-or-treated in the northeast knows all too well, having to wear a jacket over a Halloween costume totally ruins the effect, and there were costumes aplenty throughout the crowd. Princesses, witches, superheroes, skeletons and pint-sized pumpkins were some of the standouts. Costumed crowds take in one of the many ¡Calabazafest! performances. Photo by Simon Glenn-Gregg for Bushwick Daily. 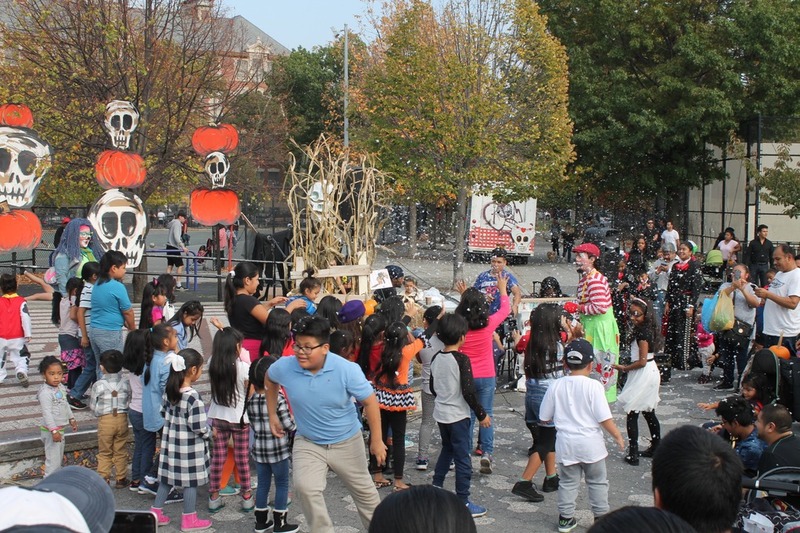 At the center of the park, a stage show flanked by handmade monsters and pumpkins kept everyone entertained. 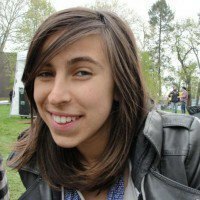 Guest MCs and returning favorite ¡Calabazafest! performers Martillito y Smiley Burbujita, a duo of street clowns, had the assembled crowds cheering throughout the entire event. 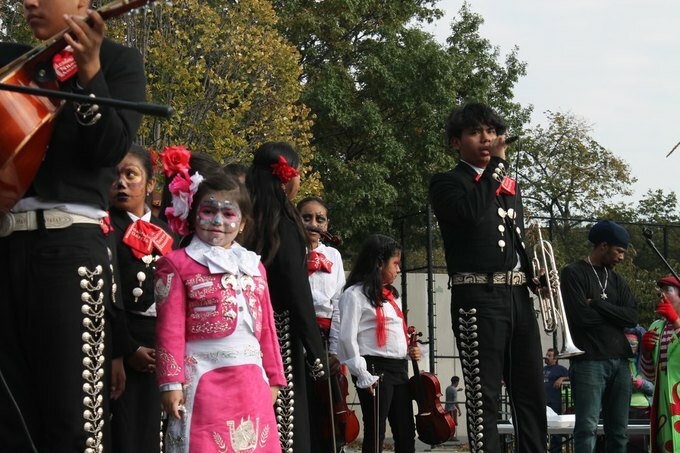 Mariachi students onstage at ¡Calabazafest!. Photo by Simon Glenn-Gregg for Bushwick Daily. Other performances brought down the proverbial house as well. The talented students of the NYC Mariachi Conservatory, some of whom wore calavera makeup in addition to their traditional charro suits, played and sang beautifully, and performers from Mazarte Dance Company presented dizzying, vibrant Mexican dance. Mexican heritage dance at ¡Calabazafest!. Photo by Simon Glenn-Gregg for Bushwick Daily. An ever-popular pumpkin carving station was thronged with young artists eager to make their own jack-o-lanterns, and many came away from El Peunte's face painting station sporting adorable makeup (organizers at the station told Bushwick Daily that a seasonally appropriate and perennially cool Batman design was the day's most popular look). 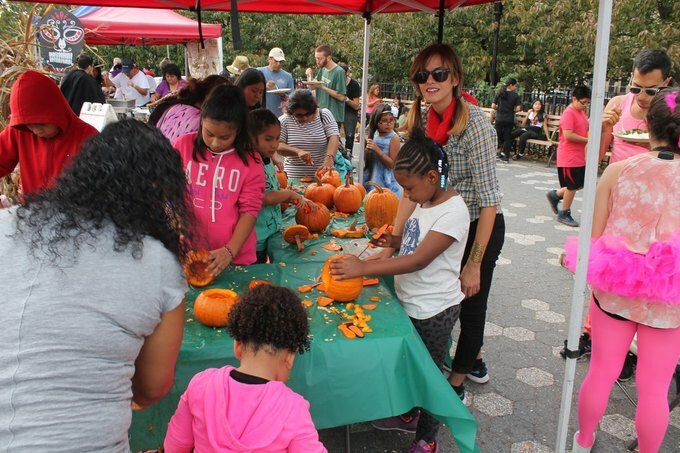 Happy young pumpkin carvers at work at ¡Calabazafest!. Photo by Simon Glenn-Gregg for Bushwick Daily. 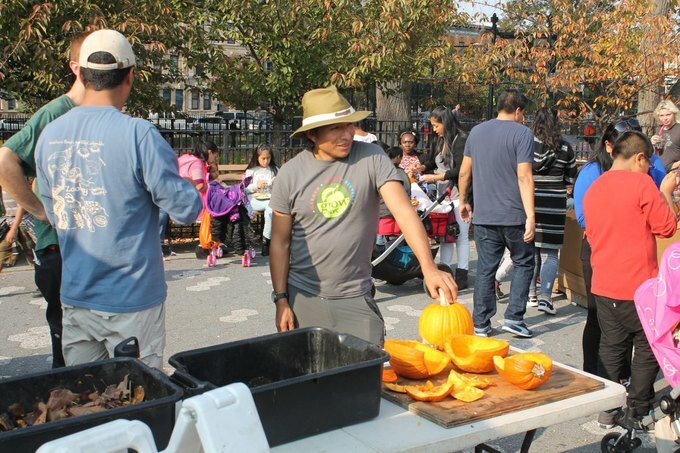 City Council Member Antonio Reynoso gave this year's ¡Calabazafest! 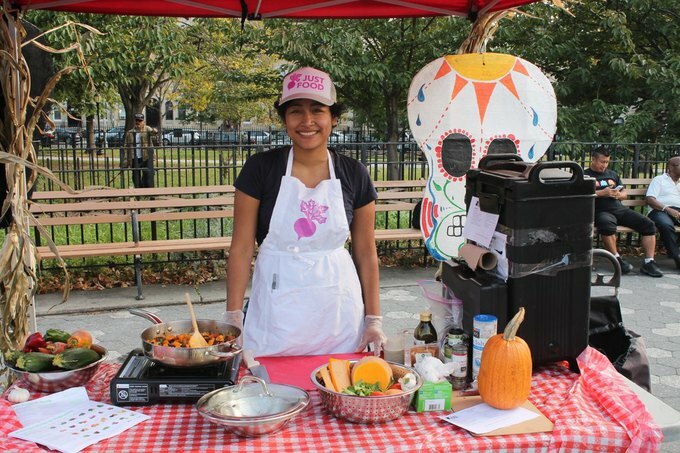 some major support, securing Parks Equity Initiative funding for the event and enabling organizers EcoStation:NY to bring in Tortilleria Mexicana Los Hermanos and The Doe Fund's culinary arts program to serve mouthwatering food, which was free to the public! 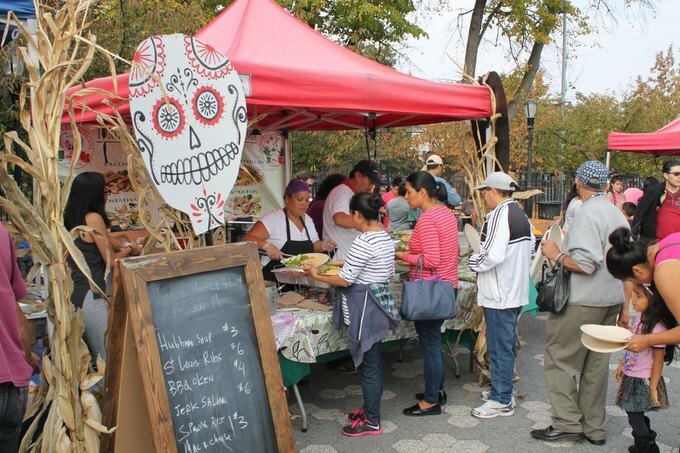 Tortilleria Mexicana Los Hermanos serves up the eatery's signature dishes to the public at ¡Calabazafest!. Photo by Simon Glenn-Gregg for Bushwick Daily. Los Hermanos served items from the menu at their beloved Starr Street home base, and the Doe Fund prepared picnic dishes like barbecue ribs and chicken and macaroni and cheese, some more unusual offerings like a long grain pineapple rice and jerk salmon, some seasonal soups including one made with hubbard squash, and pastries such as small hand pies and cookies. The event's fully compostable dishes and cups, once used, could be brought to the composting and vermiculture demonstration that was set up between the food tents and the pumpkin carving station. EcoStation's Victor Flores mans the composting demonstration at ¡Calabazafest!. Photo by Simon Glenn-Gregg for Bushwick Daily. 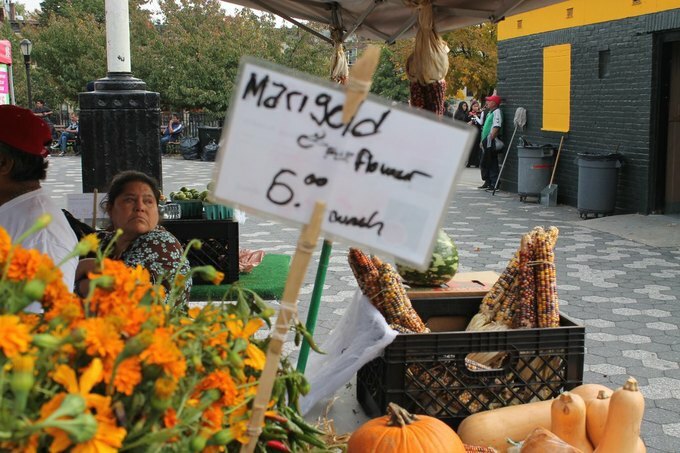 A miniature version of EcoStation's weekly Bushwick Farmer's Market was set up across the square. Marigolds for sale at Pavia Family Farm's table at ¡Calabazafest!. Photo by Simon Glenn-Gregg for Bushwick Daily. Pavia Family Farm from Hazlet, New Jersey sold seasonal offerings, including luminous bouquets of marigolds, multicolored flint corn and flavorful concord grapes, and at an EcoStation-run stand, apple cider from Migliorelli Farm was offered alongside artisan-crafted strings of bright papel picado flags from Mexico. 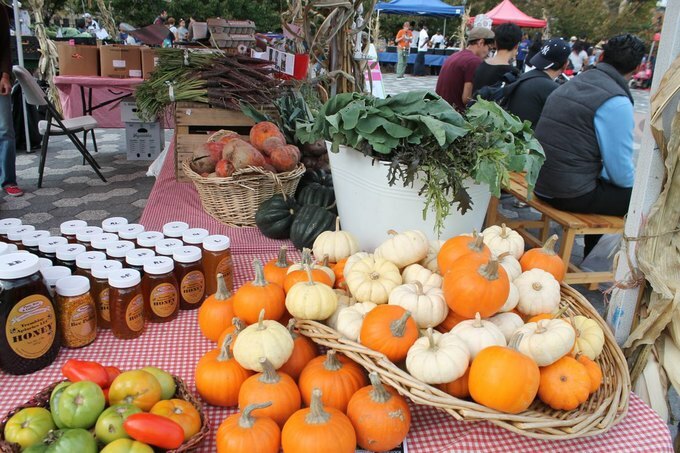 Seasonal bounty at EcoStation's table at ¡Calabazafest!. Photo by Simon Glenn-Gregg for Bushwick Daily. Elsewhere in the heart of the park, Ridgewood Bushwick Senior Citizens Council assisted locals with the Food Stamp signup process, the Bushwick Food Coop served samples of some of their favorite snacks and handed out Coop Coupons, and Just Food held a cooking demonstration, teaching the public how to prepare a fragrant and colorful sweet potato red bean chili. A sweet potato and red bean chili cooking demonstration at the Just Food tent at ¡Calabazafest!. 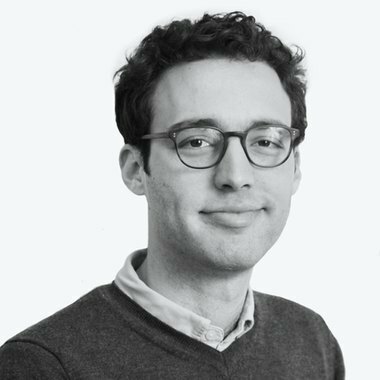 Simon Glenn-Gregg for Bushwick Daily. Featured image: ¡Calabazafest! MCs Martillito y Smiley Burbujita invite their audience to join in some messy fun. Simon Glenn-Gregg for Bushwick Daily.